If you haven’t heard about Nitro Coffee yet, you’ve likely been living under a rock. With brands like Starbucks recently announcing that they’ll be adding cold brew and nitro coffee on draft in all locations by the end of 2019 it’s time to take notice if you haven’t already. In December of 2018, Starbucks announced that it would begin selling nitro coffee in all of its US retail locations. At the time of the announcement, about 2,500 of the 8,500 Starbucks locations sold nitro coffee on tap. The announcement came on the heels of dipping Frappucino sales due to a noted increase in customers becoming more health conscious about sugary drinks. Starbucks launched nitro coffee in the summer of 2016 with a test market of about 500 stores. From there, they announced in the summer of 2017 that they’d be expanding their nitro coffee program into nearly 1,500 stores by the end of 2017. With growth and expansion statistics like that, you cannot afford to ignore nitro coffee. Nitro coffee is cold brew coffee that is infused with nitrogen. Why nitrogen? What is the point? If you’ve tried cold brew coffee, you’ve likely noticed that it has a much smoother, richer taste and flavor than traditionally hot brewed coffee does. Infusing the cold brew with nitrogen gives it micro-bubbles that give it a creamy texture and mouthfeel without adding any milks or sweeteners. Why not CO2 or other gasses? Trust me on this one, stick to nitrogen. We’ve tried other gasses and they haven’t turned out good. We tried CO2 when we first started with draft coffee, in fact, I wrote a blog post about it that I will have to try to dig up. The carbonic acid in CO2, when combined with cold brew gives a very acidic and astringent bite to the drink and in my opinion, makes it completely unappetizing. Using CO2 with coffee would require the addition of a sweetener or another flavor enhancer in order to make the coffee palatable. Another gas that is common in bars and restaurants is called “beer gas”. Beer Gas is a blend of Nitrogen and CO2, typically in a ratio of about 75% Nitrogen to 25% CO2. We actually used beer gas heavily at the beginning of our nitro coffee adventures and from a functionality standpoint, it worked great to create the cascading effect that you look for in a cup of nitro coffee. The problem however, was the CO2 in the gas and over time, the CO2, even in the small amount, starts to ‘sour’ the coffee and give it an undesirable flavor. If you need a laugh, take a look at the time that we made helium infused cold brew coffee to make what we refer to as CoffHe. Getting back on topic, nitro coffee is cold brew coffee that has been heavily infused with nitrogen and when poured, the nitrogen in the beverage is “agitated” through the use of a restrictor plate inside the faucet and this causes micro bubbles in the glass and beautiful cascading effect. The faucet used to pour nitro coffee is the same style faucet that is used to pour Guinness, and the resulting effect is the same — a dark beverage with a beautiful amber-gold cascade. Method 1: Pre-Infusing the keg with nitrogen. At first, nitro coffee was made by infusing cold brew with nitrogen inside the keg. This was either done at high pressures, over long periods of time, or with the help of a Quick Cascade Keg Lid – which has a high pressure hose and a diffusion stone that allowed nitrogen to be dispersed in the cold brew, rather than into the headspace of the keg. Method 2: Infusing the cold brew on-demand. As nitro coffee has grown in popularity, the number of products being offered to support cold brew and nitro coffee has also grown. The birth of the NitroNow Nitro Infuser. As you can imagine, instant, on-demand nitrogen infusion simplifies things quite a bit as it allows you to take a flat keg of cold brew coffee and turn it into nitro coffee as you pour it. Method 3: Canned nitro coffee. While this format is not exactly easy to accomplish, we are seeing more and more companies launching cans of nitro coffee. Both Method 1 & 2 above require draft equipment in order to serve the nitro coffee with the final requirement being a stout faucet (preferably stainless steel), now commonly being referred to as a nitro faucet or nitro tap. The reason a stout faucet is required to serve nitro coffee is to “agitate” the nitrogen in the liquid as it is being served. Without this crucial step, you would not get the vigorous cascading effect that has become synonymous with nitro coffee. As mentioned briefly above, the coffee is agitated when it passes through a restrictor plate or jet disc that is within the stout faucet at a high pressure. The jet disc has 5 small holes which slows the flow of liquid and excites the gasses that are in the liquid. The nitro coffee then passes through the stout faucet nozzle where it is redirected into a steady stream by the regulation cone. It then hits the glass and allows you to marvel at its cascading beauty. What Does Nitro Coffee Taste Like? Nitro coffee, at its core, tastes like cold brew coffee. The difference in taste comes in the texture and mouthfeel of the coffee due to the nitrogen that has been infused into the liquid. If you’ve seen a nitro coffee, you’ve likely noticed the small, creamy head that sits on top. That crema is made from micro-bubbles which give the coffee a much softer, velvety taste than it would have without the nitrogen. Nitro coffee, assuming it is made from cold brew which is just coffee and water, is considered a zero calorie beverage in most cases. Nitro coffee uses coffee, water and nitrogen. Nitrogen makes up about 78% of our atmosphere, so it is an element that we all already consume everyday. Nitro coffee is beginning to take the place of energy drinks in many gyms around the country. Gone are the days of chugging a Monster, Red Bull or 5 Hour Energy before a workout. Many CrossFit gyms now offer nitro coffee on draft as a pre-workout beverage and why shouldn’t they? A zero calorie, caffeinated drink that tastes good? It’s a gym-goers dream. Nitro coffee is a velvety smooth beverage that gives the impression of cream and sugar without any additives other than coffee, water and nitrogen. It’s a great, healthy alternative and doesn’t add any calories to your diet. So what do you do? Where do you start? That depends on who you are and what you’re looking to do. If you’re not already offering a cold brew and nitro coffee selection, you are well behind the curve (which likely comes as no surprise). We talk to people all of the time who are just starting to offer up nitro coffee at their locations because they thought that cold brew and nitro coffee were “just a fad” or going to fizz out over time, so they never made the investment in cold brew and draft coffee equipment. If you find yourself in the same situation, you’re behind the curve, but don’t let that discourage you. We’ve put together a number of resources that have helped coffee shops, cafes and roasteries around the world get equipped and setup to start serving nitro coffee. Just getting your feet wet with cold brew coffee and draft coffee? 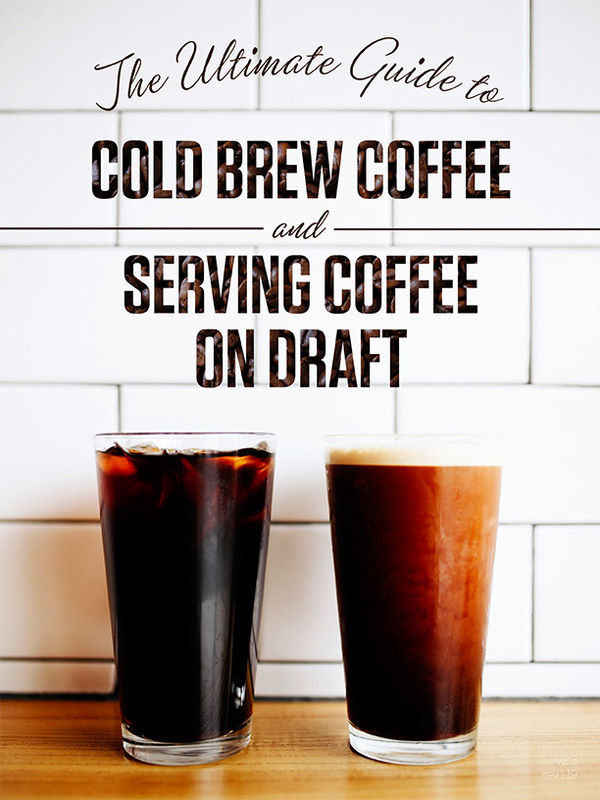 Check out this free ebook, The Ultimate Guide to Cold Brew Coffee and Serving Coffee on Draft. This ebook has been revised for 2019, so if you just happened to find this post, make sure you download the most current version of the ebook (available at the link above) to ensure that you’re getting the most up-to-date information available. Have a little bit more experience on the cold brew side of things, but looking to dial up your draft coffee game? We put together a more in-depth look at draft equipment that details how to serve up cold brew and nitro coffee on tap. Plus, it gives you a piece by piece look at all of the components of a draft system and explains how they all work together. 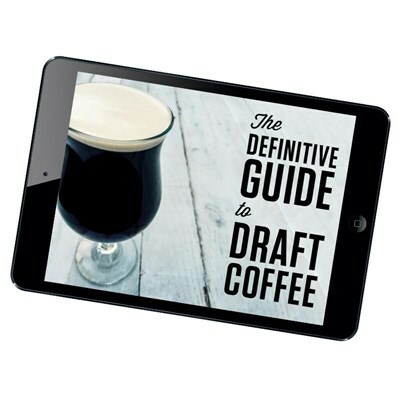 This can all be found in a second ebook, The Definitive Guide to Draft Coffee. Those two ebook resources should get you going on your journey to making cold brew coffee and getting the proper equipment setup to serve cold brew and nitro coffee on draft, but if you are the type of person who doesn’t like to read, there is one more option for you. 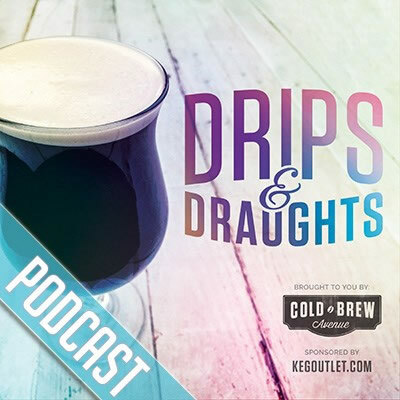 Check out the Drips & Draughts Podcast. The podcast was launched to help answer common questions that we received regarding all facets of draft equipment, but over time, the cold brew and coffee community gravitated toward the show, so it features tips & tricks and interviews from many of the leaders in the cold brew and nitro coffee spaces. Maybe you tried cold brew or nitro coffee at a small coffee shop and fell in love with it, and now you’re looking to have it in the convenience of your own home. It’s easier than you think! Take a look at these Nitro Coffee Starter Kits to get an idea of the components involved. We’ve talked to a large number of coffee lovers who have found cold brew while looking for a less acidic way to still enjoy a cup of coffee. It’s easy to brew at home and it’s just as easy to brew at home and take to your office. So if you’re not currently cold brewing coffee or serving on draft, don’t be discouraged – it really isn’t that difficult once you become familiar with the components. Believe it or not, we’ve talked to a large number of small companies who launched a business with a single product — cold brew. The beautiful thing about cold brew is that it is simple and doesn’t require many of the additives and sweeteners that are commonly put into a hot coffee. That makes it much easier to serve on-the-go, at events and festivals. Many companies have been started up serving cold brew and nitro coffee as a side hustle on evenings at farmers markets, or on weekends at busy places like beaches, parks and more. Just make sure you have the proper approvals and permits if you decide to start a business serving nitro coffee. Now that you know what nitro coffee is, you might be wondering how to actually make nitro coffee. Don’t worry, we’ve got you covered with our post How to Make Nitro Coffee. What is the Future of Nitro Coffee? Where will nitro coffee go from here? At the time of this writing, cold brew and nitro coffee has seen about 5+ years of exponential growth, so the future looks bright for nitro coffee. Do I know where it will be in 5 years from now? No, but I can almost guarantee I’ll still want some in my fridge!